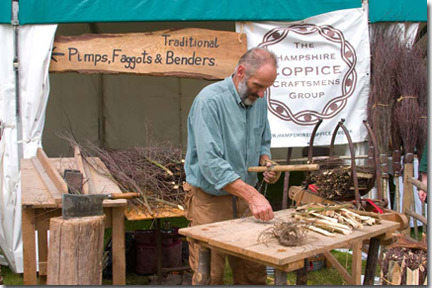 Welcome to the Hampshire Coppice Craftsmens' Group Press Page. HCCG was formed in 2003 to promote the work of coppice workers within Hampshire as well as providing a united voice for the county’s coppice industry. The group also helps to form links between the coppice industry and relevant agencies and land owners. For more information on the aims of the group please see our Mission statement. The purpose of this page is to give the Press an informed view of the coppice industry as well as explaining the main terms used. For additional information about each of the subjects, a link has been provided to the relevant section on the FAQ page. Alternatively, please contact the Coppice Group. In layman's terms it is cutting a tree at ground level to promote regrowth. Of the tree and shrub species in Britain the most commonly coppiced are hazel (Corylus avellana), sweet chestnut (Castanea sativa), willow (Salix), and ash (Fraxinus excelsior). Oak (Quercus spp) was also commonly coppiced although little of this remains in working rotation. Other species that are commonly found in coppiced areas are holly (Ilex aquifolium), field maple (Acer campeste), spindle (Euonymus europaeus) and Whitebeam (Sorbus aria). All of these species can be found either as coppice or as standard (single-stemmed) trees. A group of HCCG members at a coppice workers' camp. The coppicing of woodland is probably one of the oldest forms of woodland management. Hazel coppice can be used for a wide range of products- from spars and hedging stakes to hurdles and pea and bean sticks. Chestnut is still widely used for fencing. Coppicing also has a positive impact on some of Britain's many endangered species such as dormice, butterflies and plant species. However, the rarest and most elusive creature in the coppice woodland is probably the coppice worker! HCCG has members all over the county of Hampshire. Many of our members are professional coppice workers, although they may not work in the coppice full time. How is the coppice cut? As outlined in the 'What is coppice?' section, coppicing is the cutting of a tree at just above ground level to encourage the regrowth from this point. There are many theories about the height at which coppice should be cut, but most experienced coppice workers will tell you that it should be less than a foot above ground level or the stems will blow over in the first winter. The tools of the trade have changed little over the centuries although in the latter half of the 20th century the chainsaw has become more common among the coppice workers. Many still use a bill hook or axe. Once cut, the bill hook is the tool of choice to process rods and poles into products. As well as the products outlined above several of the species make very good firewood and charcoal thus reducing the carbon foot print. By using lump wood charcoal produced in the United Kingdom you are reducing the fuel miles and helping with the sustainable management of woodland in the UK. Much of the charcoal that is imported from other countries has not been produced from sustainable woodland.